A Mitchell analysis of 15 popular luxury and mainstream vehicles found the cost of front-end collisions rose 29 percent and rear-end repair bills rose 14 percent following a major redesign. When both types of damage occurred on a single car — say the unfortunate middle car in a three-car pileup — the cost rose 23 percent. 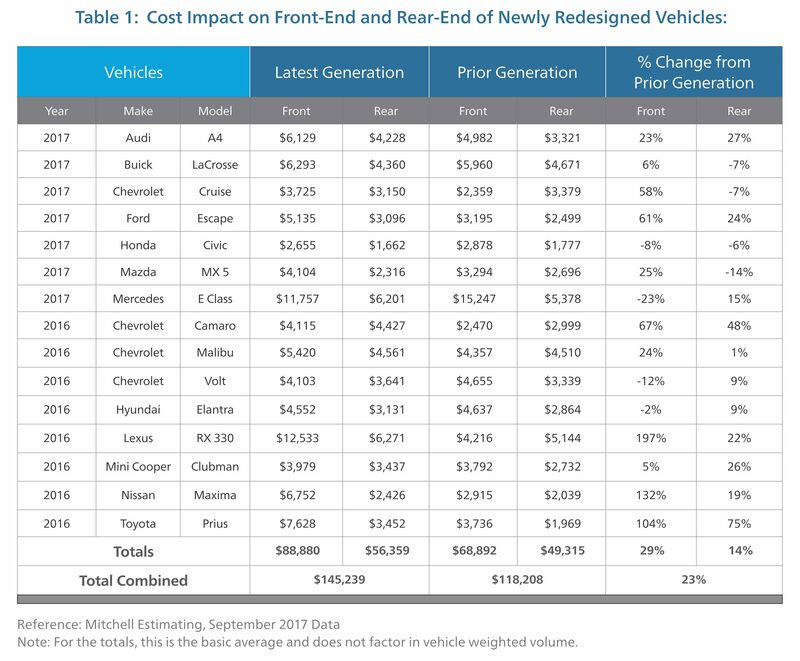 The study, presented Tuesday in Mitchell’s fourth-quarter Industry Trends Report, added up the repair costs for previous- and next-generation (or “significantly refreshed”) versions of the study cars and used it to generate an index. Front-end repairs were defined as anything related to the bumper, grille or headlights, including any sensors available as even an option for the model. Rear-end repairs were classified as all OEM parts (including sensors) and labor related to the bumper and headlights. The research excluded factors like scanning, calibration, and everything else (for example, radiators, which would need to have been repaired or replaced (such as airbags) during a moderate crash. 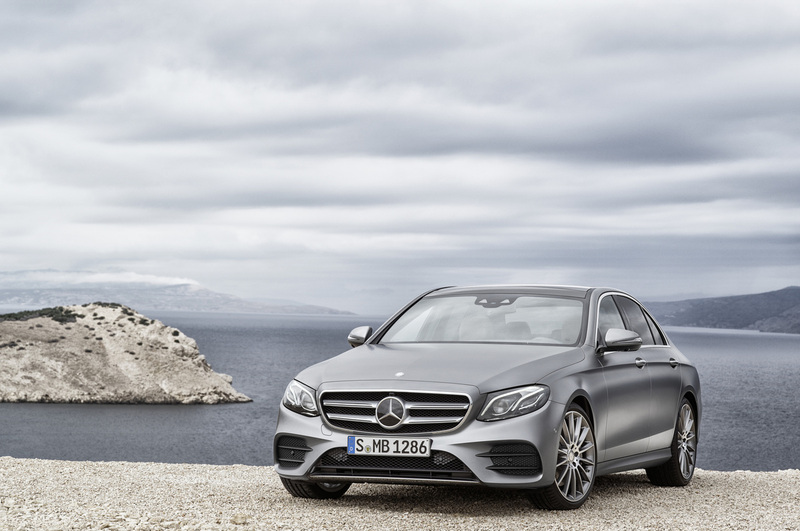 Some of the vehicles actually saw price reductions between generation, most notably the 2017 Mercedes E-Class. The car in its tenth generation saw an combined reduction of about 13 percent after a 23 percent decline in front-end repairs was offset by a 15 percent increase in rear-end repairs. 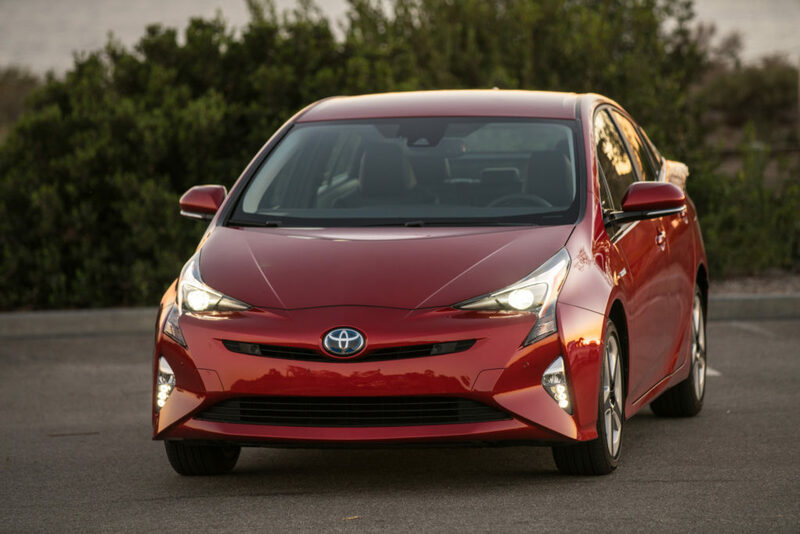 But most of the vehicles saw price increases, with the 2016 Toyota Prius (repair costs rose 94 percent when both front and rear hits are considered) and 2016 Nissan Maxima (85 percent) seeing the largest gains out of the nonluxury models. Littooy attributed the increase in the majority to the inclusion of advanced driver assistance systems unavailable in the previous generation — but also just better versions of existing technology. 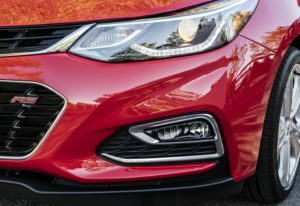 The 2017 Cruze headlights have LEDs in some of the higher trims, and the Premier version has an optional version sporting high-beams able to toggle themselves on and off depending on oncoming traffic. Littooy pointed out just how many of various devices repairers and insurers could expect to encounter on the various vehicles. Parking assist sensors can cost $170-$199, and a vehicle can have as many as four in the rear and six in the front. Some vehicles might have a front-facing camera in the grille, for an average cost of $500-$900, and/or one in the rear bumper. (Come the 2018 model year, every vehicle needs at least one rear-view camera, though these aren’t always necessarily going to be found in the bumper.) Finally, a front-facing radar system can cost $600-$900 and be found in either the grille or bumper, according to Littooy. On the plus side for insurers, this technology ultimately ought to save carriers money by preventing collisions while parking or driving. But Littooy suggested that actuaries might want to factor in the potential severity when calculating a driver’s premiums. Littooy’s research also provides ammunition for collision repairers taking heat from an adjuster, DRP manager or out-of-pocket customer over rising severity. It might be inappropriate for these parties to blame the body shop for a higher bill when Mitchell’s research shows the price to fix a next-generation vehicle rises 23 percent by default. Besides, if a carrier took Littooy’s advice and better incorporated the repair costs into the premiums up front, then the adjuster or DRP manager has no reason to complain — their insurer has already anticipated and charged the customer for the risk of that expense. If the carrier didn’t think that far ahead, then that’s its problem (or its reinsurer’s), not yours or your customer’s. And if a customer gets upset, just tell them never to buy a car newer than the 2015 model year again. Voila! You just saved them 23 percent on their next repair.